It would appear that business has developed a distinctly oriental flavour for AV installation specialists, Sound Division. Hard on the heels of the installation in the exclusive Just Oriental in London's Piccadilly comes a comprehensive AV installation into a brand new bar called the V-Bar which belongs to the adjoining Mandarin Palace Chinese restaurant in Hornchurch in Essex. In this instance the client required a full PA set-up, lighting and plasma screen in addition to a background music system. 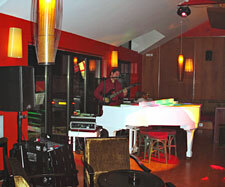 Sound Division's David Graham explained that the V-Bar is a new piano bar that is attached to the main restaurant. "It's a very picturesque setting so they wanted to make the most of it with a proper professional set-up." To this end, Sound Division supplied and installed a pair of Martin Audio Blackline F10 2-way passive loudspeaker systems on stands, a Soundcraft Folio FX8 8-channel rackmount mixing console, a Behringer DSP1124P feedback exterminator and a selection of Shure microphone systems including a PGX24 SM58 handheld wireless system, a hardwired SM58 handheld mic, and a Beta 91 condenser microphone for the grand piano. A Martin Professional Wizard and a Mania DC1 liquid light effects unit were installed to create an atmosphere for dancing later in the evenings and to enhance the pianist. A final touch is a sleek 42-inch Philips plasma TV and Freeview Box that was installed in time for the World Cup. Sound Division also specified a high quality background music system into the V-Bar comprising four Martin Audio AQ6 ultra-compact architectural loudspeakers. Both sound systems are powered by Crown XLS Series amplifiers. "The results are very pleasing," confirmed Graham. "The V-Bar now benefits from a versatile AV and lighting system that can cater for a DJ as well as live music, so it will be a great venue to hire out for private parties, as well as offering restaurant customers a lounge/club-like environment after their meal." Owners Peter and Johnny Yeung are equally satisfied. "Properly equipped as it is now, the V-Bar is a real asset to the business, and Sound Division has done us proud. We were particularly pleased to get the plasma screen installed in time for the World Cup, although we'd have preferred the England team to have stayed in Germany a bit longer!"